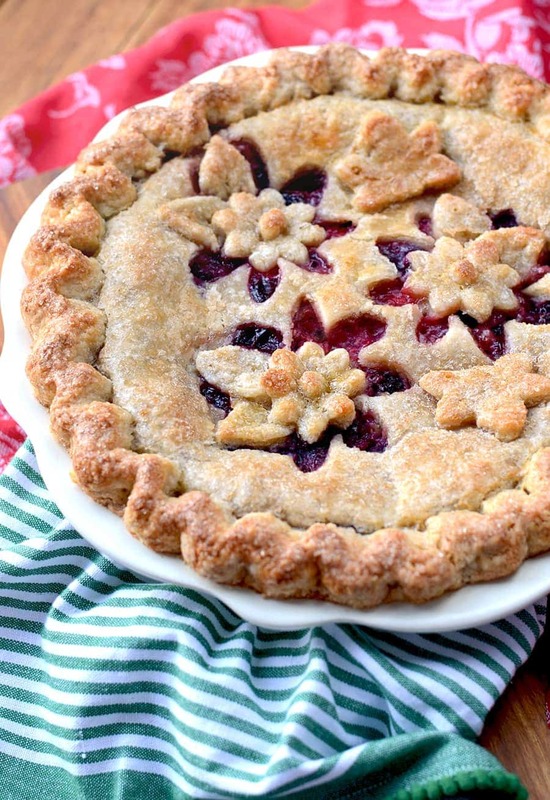 This Magnificent Mixed Berry Pie is the star of summer! 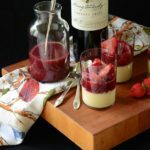 Its buttery almond crust highlights summer’s abundance of raspberries, blackberries, blueberries and strawberries. It’s picnic season and while some people may think of fried chicken and potato salad, I daydream of summer pies. I remember picking wild blackberries as a child and eating almost as many in the field as I brought home. Those berries were so plump that the forgotten bushes would fill buckets to overflowing. I’m trying to recreate those days in my backyard by planting berry bushes, but in the meantime I will have to settle for store-bought fruit. That’s okay because I have homemade pie! 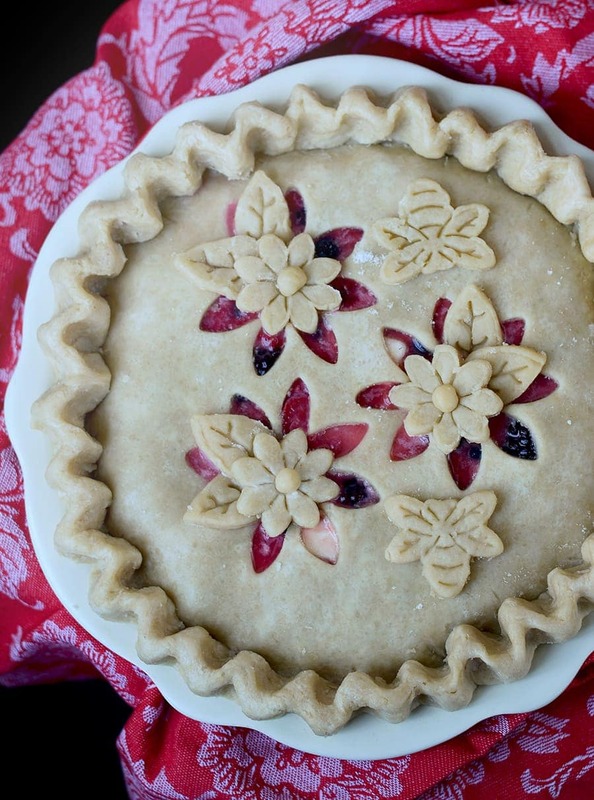 Delicious, fruity, sweet pie that has been making the rounds at various summer picnics. First, I took this pie to a taping of Wait, Wait Don’t Tell Me! at Wolf Trap where we met up with Kevin’s siblings and their spouses. There’s nothing like a picnic on the lawn at Wolf Trap. Every time we go we run into friends and this time was no different. But you also make new friends as everyone waits for the show to begin. So, when it came time for dessert we shared this Magnificent Mixed Berry Pie with our friend Tisha and a nice guy sitting next to us. Nothing like homemade pie to bring people together…and laughter, because Paula Poundstone is hilarious! After that success I took two pies to my family reunion. It began to pour just as the picnic started, so the crowd thinned out rather fast. I guess after you’ve filled your belly full mac and cheese and hot dogs, you really need those silly lawn games to keep you awake. Pretty sure everyone went home to take a nap. So, pie leftovers ended up in the hands of neighbors. It’s all good because I love having taste testers! Luckily, everyone has given this pie rave reviews ranging from “It was awesome!” to “Best pie of my life”. It’s not surprising that this pie has been a hit. The mixture of blueberries, raspberries, strawberries and blackberries create an intensely fruity filling that is complimented by fresh lemon and almond flavors. But the butter and almond crust is equally as delicious as the berry filling. It’s flaky and sweet but also easy to work with. 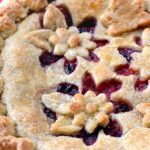 The dough rolls out easily and mends well, which is why its ideal for making a pie with cutouts. You can reroll the scraps and they turn out just as well as the first time. If you’ve ever worked with a fussy pie dough you know what I mean. And if you haven’t made pie dough from scratch, this is a great way to start. I make it in the food processor, which makes it easy and fast. If you want to make your pie look like mine, you’ll need some cookie cutters. I used this flower cookie cutter and these pie cutters from Williams-Sonoma. Unfortunately, the pie cutters I used are discontinued, but found this Cake Boss set has a similar flower shape or you could use a strawberry cutter or any other shape you would like. The trick is to refrigerate your dough in between steps so that the cutouts hold their shape. 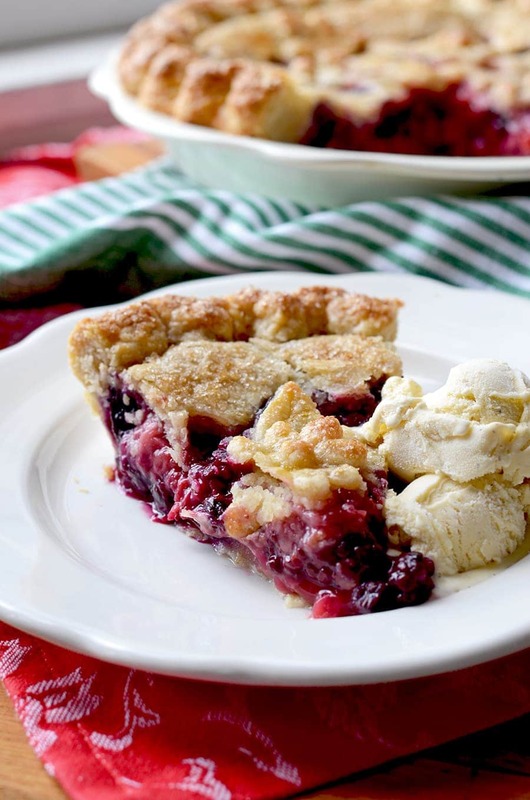 Follow the recipe instructions to make your own gorgeous Magnificent Mixed Berry Pie. This is a great way to impress folks at your office picnic or family reunion. 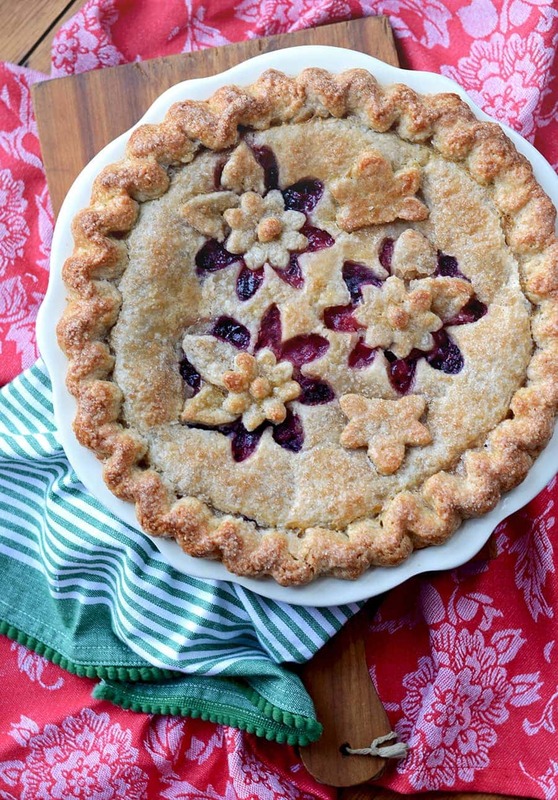 We love going to the farmers market to pick up the fresh berries for this pie. In a food processor combine AP flour, almond flour and sugar. Pulse dry ingredients and add half of the butter and pulse a few times. Add remaining butter and pulse until the coarse crumbles form. Add in vinegar, pulse again, and then add ice water a tablespoon at a time, pulsing between each addition of water. Dough is perfect when it forms large crumbles that hold together when squeezed. Wrap dough in plastic wrap and refrigerate until firm. In a bowl combine all of the filling ingredients and gently stir to combine. Generously flour a piece of parchment paper and roll out half of the pie dough. Line the bottom of pie plate with it and move it to the refrigerator. Roll out top crust on a piece on the parchment paper. Cut out flower shapes in the center and transfer crust on the parchment paper to a cookie sheet and refrigerate until firm. 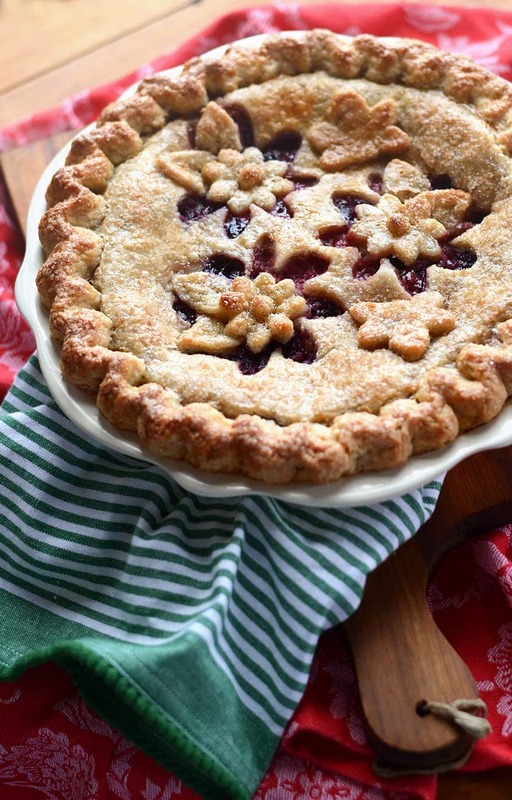 Once both crusts are cold, fill the pie shell with berry filling and top with crust. Trim excess pie crust and crimp edges. Using leftover dough, stamp flowers, leaves and bees. Using a little bit of water, adhere the cutouts to the crust. Place in the refrigerator to set for at least an hour. About 20 minutes before baking, turn on oven to 350F to preheat. Stir together cream and egg in a small bowl. In another bowl combine sugars. Brush pie with egg wash and dust with sugar. Bake pie for 60 minutes, turning pie every 15 minutes for even browning. 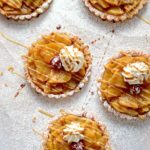 Pineapple Rum Tartlets are rich, buttery and filled with a rum, brown sugar pastry cream…so delicious! And the bee cutouts are cute. Oh it is! Almost like a cookie! And the bee cutouts are so adorable…just wish they held their shape a little better. Thanks for stopping by Patrycja! I look forward to discovering your recipes! This turned out beautifully!!! Love the flowers!!! Your crust is beautiful! I have some pie crust cutout cutters I never seem to get around to using. Now, I’m feeling inspired. Thank you! Mixed berry is definitely my favorite summer pie filling! I’m blown away by your photos and those gorgeous crust cut-outs – lovely work!